We would like to personaly thank the Organisations and Companies who are supporting the diverse research projects we am conducting at Dyer Island. With the support of these people and organisations, we are able to pursue our goals: the better understanding of the Ultimate Marine Predator - The Great White Shark. This understanding will lead to a conservation oriented public and to a better protection of all sharks. Thank you very much for your continuing support! The PADI A.W.A.R.E. Foundation has sponsored the photographic identification research project and the White Shark Trust every year since 1999. In 2006, they renewed their support in sponsoring the film expenses and associated recording costs (CD-R, DVD-R and photocopies), as well as a Digital Data Projector for our educational talks in schools and for the public. The Synchronicity Foundation has supported the White Shark Trust in 2005, and their contribution allows the field research to continue. The PADI Project AWARE has sponsored and supported the Photographic Identification project in 1999, 2000, 2001, 2002, 2004 and 2005. These grants covered the film purchase and processing. In 2002, PADI Project AWARE also sponsored the purchase of a digital camera. The Wildlife Conservation Society (WCS) has awarded a grant in May 2002 for equipement (Garmin GPS Map 232 and Apple G4 iMac) and the expenses related to the boat insurances and maintenance for the second semester of 2002. The Wildlife Conservation Society (WCS) has awareded another grant in July 2003 for the boat maintenance and insurance, as well as the costs for bait and chum for the second semester of 2003 and first semester of 2004. WWF, the Conservation Organisation, sponsored the petrol expenses associated with the running of the research vessel "Lamnidae" from April through December 2002. The international Fund for Animal Welfare (IFAW) sponsored the petrol expenses associated with the running of the research vessel "Lamnidae" from December 2001 through March 2002. Sigma XI sponsored the Film Roll Adapter for the Nikon Super CoolScan 4000ED film scanner in 2002. This adapter enables the automatic scanning of an entire roll of film. The Camera Guy supported the White Shark Trust in 2002 offering a Nikon CoolPix 5000 Digital Camera at cost price. Foto First in Hermanus supported the White Shark Trust in 2001 offering a Nikon Super CoolScan 4000ED film scanner at cost price. Pentax Switzerland supported the project in 1998 offering the range of their products at cost price. Bucher & Walt SA based in Switzerland supported the project in 1998 offering two Garmin GPS 12 at cost price. Bucher & Walt repeated their support in 2002 offering the project a Garmin GPS Map 232 at cost price. Bucher & Walt SA based in Switzerland supported the project in 1998 offering two Garmin GPS 12 at cost price. P.Wyss Photo-Video en Gros based in Switzerland supported the project in 1998 offering Pelican Cases at cost price. The sign shop Supersigns in Chichester (England) sponsored the White Shark Trust signs on Chris Florescu's car, and help the trust with any other sign productions or banner needs. We would also like to thank the individuals, organisations and companies who help us in the field, and/or contribute and/or support one of our projects. The Carcharias Boutique, owner Juan Lahore and manager Lance Coetzee, support the White Shark Trust and Michael Scholl in donating merchandise and space for displaying information in this dedicated clothing shop located in the little harbour of Kleinbaai. Tertius and Michael Lutzeyer, owners of Grootbos Nature Reserve, have helped Michael Scholl many times. They have shown great support to the research efforts conducted on the White Sharks by Michael. 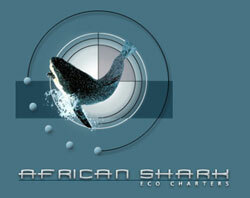 Shark Africa supports the White Shark Trust by sharing dorsal fin photographs of White Sharks sighted in Mossel Bay. These photographs are very useful to study the White Shark movement patterns between Dyer Island and Mossel Bay. Marine Dynamics, owned by Wilfred Chivell and based in Gansbaai, supported the White Shark Trust offering our research team space on their boat Shark Fever to conduct our fieldwork. The Research Internship and the research field work during 2006 has been entirely conducted from Marine Dynamics' Shark Fever boat. We appreciate immensely this generous opportunity. Dyer Island Cruises, owned by Wilfred Chivell and based in Gansbaai, supports the White Shark Trust by welcoming its Field Research Assistants on board their Whale Watching excursions during the Whale season. Dyer Island Cruises is also responsible for bringing the injured and oiled birds from Dyer Island to Cape Town where they will be treated by SANCOB. Shark Diving UnLimited based in Gansbaai sponsored and supported the White Shark Trust offering assistance and logistical support to the field work. Our Field Research Assistants were occasionally invited to join this company to complement the fieldwork or to cage dive. Shark Diving UnLimited also sponsored the engine covers protecting the Sharks from accidental injuries. Natal Sharks Board based on the Kwa-Zulu Natal coast in South Africa supports the White Shark Trust by sharing dorsal fin photos of the White Sharks caught in the nets. White Shark Ecoventures supports the White Shark Trust by sharing dorsal fin photographs of White Sharks sighted at Dyer Island. Robert Cope, Divemaster and Shark Guide, has taken many very useful identification photographs. African Shark Eco Charter based in False Bay supports the White Shark Trust by sharing dorsal fin photos of the White Sharks sighted in False Bay. The White Shark Diving Company based in Gansbaai supported the project in 1999 and 2000 allowing for the field work to take place on their commercial cage diving vessels. The White Shark Trust sometimes leaves the Gansbaai / Dyer Island area to conduct field work in other White Shark areas. On these research expeditions away from our usual logistic home, we rely on local help and supporters such as the ones presented below. We thank these organisations and companies for their support and help. We are very thankful to Struisbaai House Rentals for organising our accommodation during our stay, and to Chris Smith for accommodating us in his house at a good rate.